Did I ever tell the story about a manager I had at a major defense electronics firm who thought he could make an NPN transistor by wiring two diodes in series with the anodes tied together? He reasoned that since a bipolar junction transistor consisted of three alternating layers of n-type and p-type silicon, the device could be affected per his scheme. That was in the mid 1980s when I was still a technician (working diligently on my BSEE degree at night). Needless to say the engineers who worked under him were not too impressed with the guy's technical prowess (nor his managerial prowess, as I remember it). I didn't consider myself qualified at the time to judge him one way or the other, so the fact that he was a good guy made him OK in my book. 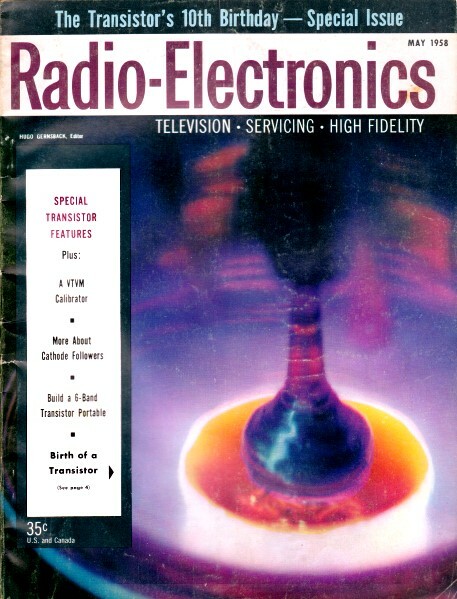 This article from the year I was born (some doubt the 'born' claim) reports on the advancements druing the first decade of the transistor era. It was just before Christmas of 1948 that Mssrs. Brattain, Bardeen, and Shockley announced to the world their universe-changing invention. Transistors have been with us for a decade and much has happened in that brief period, Here is a condensed history of the transistor from its inception in 1948. Just 10 years ago - on June 30, 1948 - Bell Telephone Laboratories announced the invention of a semiconductor amplifier and coined for it the name transistor. This invention has been termed one of the most significant milestones in the history of electronics. The transistor in various forms, some of them barely as large as a shoelace tip, is capable of doing most of the things electron tubes can do, and many other things as well, most of them on amazingly small amounts of power. The first form of this device consisted of a tiny wafer of germanium on which were placed two closely spaced point contacts, one controlling the flow of current in the other. It was called a point-contact transistor. Its invention, by John Bardeen and Walter H. Brattain, stimulated a tremendous upsurge in semiconductor research, which has continued without letup to the present. The upsurge has been continually stimulated over the years by new developments and constantly improving techniques, and there is no evidence that this interest will wane in the foreseeable future. The transistor has a long history of semiconductor research behind it. As far back as 1833, Michael Faraday observed that silver sulfide had a negative temperature coefficient of resistance. This characteristic set it apart from other conductors (metals) whose resistance increased with increasing temperature. By 1855, four of the fundamental properties of semiconductors- negative temperature coefficient of resistance, rectification, photoconductivity and photoelectromotive force - had been observed. Internal structure of a single-diffused germanium transistor. Bent wires from posts lead to emitter layer and base contact on surface of crystal. Heart of intrinsic-barrier transistor as seen through a microscope. Tiny electrical sandwich in center of photo contains positive, negative, neutral and positive layers and holds two tiny dots of indium, to which input and output electrodes are connected. A great body of knowledge on semiconductor materials was built up and contributed greatly to the final success of the transistor. Research workers were concerned with both surface and body phenomena. With respect to surfaces, it was postulated that a space-charge layer should exist at the surface of a semiconductor. Experiments were set up to verify the existence of this layer, and these experiments led to the birth of the point-contact transistor. Following rapidly on the heels of this development was the announcement of the junction transistor in 1951 by William Shockley of Bell Laboratories. This radically new form of the device was in many ways more effective than the original point-contact type, being freer from noise and more efficient. Most striking is that it was predicted theoretically by Shockley more than 3 years before it was demonstrated. Because of space limitations, it is not possible to review all of the advantages of transistors. However, the basic abilities such as low power consumption, small size, and reliability have been widely publicized and are well known. The junction transistor consists essentially of a sandwich of semiconductor materials into which controlled amounts of impurities have been introduced to provide specific characteristics. Germanium has four valence electrons in its outer shell and, when formed into a single crystal, there are no excess electrons or holes to conduct electricity. However, if a small amount of an element having five valence electrons is added to the germanium, excess electrons will be present, and n-type germanium results. Two such elements are antimony and arsenic. If the added element has only three valence electrons, excess holes will exist, forming p-type germanium. Elements in this class are typified by gallium and indium. The transistor sandwich then consists of a layer of n-type germanium, for example, with p-type on each side. The center layer of this sandwich is very thin. Several techniques have been developed for creating this alternate n-p-n or p-n-p type of construction in a single crystal. For example, if a single crystal is being grown of n-type material and the melt is doped to make it p-type, a thin layer will grow. If the melt is immediately doped to again make it n-type, a sandwich will be formed with a very thin center layer. This is called a grown-junction transistor. Steps involved in the fabrication of a germanium grown junction transistor1 are shown in Fig. 1. Another technique is to alloy opposite faces of a thin wafer of p-type germanium with some such material as arsenic to make the faces n-type2. This is called an alloy junction transistor is indicated in Fig. 2. Regardless of the method of fabrication, these junction transistors operate on essentially the same basic principles. A closely related device is the photo­transistor3. This was an entirely new type of electric eye - much smaller and sturdier than existing photoelectric devices. It is essentially a transistor controlled by light rather than by electric current. This transistor is employed extensively in the "card translator," a system used in telephone exchanges for automatic routing in toll dialing. Fig. 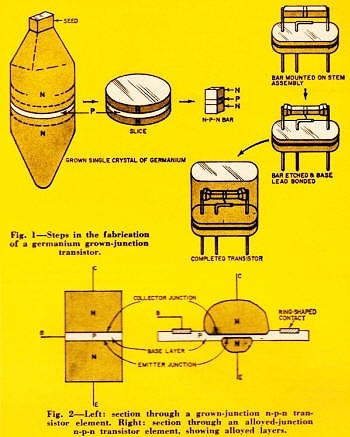 1 - Steps in the fabrication of a germanium grown-junction transistor. Fig. 2 - Left: section through a grown-junction n-p-n transistor element. Right: section through an alloyed-junction n-p-n transistor element, showing alloyed layers. The materials needed for semiconductor device research are among the purest and most perfect known to science. Large single crystals having impurities of about 1 part in 10,000,000 are routinely required. These small impurities must also be controlled to within a few percent. The major breakthrough which made such material easily achievable was the "zone-refining" technique, announced by W. G. Pfann of Bell Laboratories in 1954. In zone refining, a molten zone is swept through an ingot of the semiconductor material, such as silicon or germanium, sweeping impurities to one end of the bar. By repeated sweeps, undesirable impurities can be reduced to less than 1 part in 1,000,000,000. The technique takes advantage of the fact that the solubility of impurities in liquid semiconductor material is different from the solubility in the solid. The importance of the purification process is apparent when you realize that active impurities of as little as 1 part in 1,000,000,000 can affect transistor operation. It is essential that the material be as pure as possible to begin with, so that the desirable properties can be obtained by introducing controlled amounts of the desired impurity. Throughout the semiconductor development process, efforts were made to improve the frequency range of transistors, both as oscillators and as amplifiers. One approach was to reduce the thickness of the center layer of the sandwich, but certain limitations were encountered. A major step in overcoming these limitations was achieved with the invention of the tetrode transistor4. 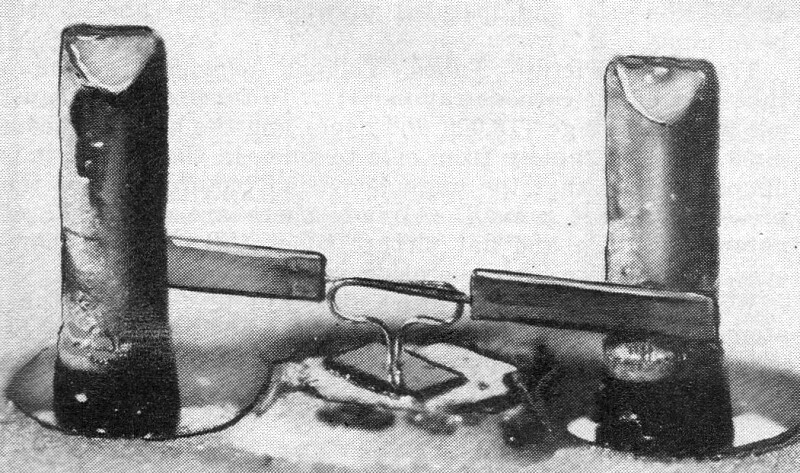 By 1955, this transistor had been developed to the point where it could be made to oscillate at more than 1,000 mc, thus breaking into the microwave region for the first time with solid-state amplifiers. Operation at such high frequencies was achieved by adding a fourth electrode to the basic junction transistor, plus other refinements. This fourth electrode permitted the center layer of the transistor to be biased in a way that reduced its effective thickness. This, combined with an actual reduction in thickeness to less than 0.2 mil, provided operation at ultra high frequencies. Completely uncontaminated metals can be produced by this zone-melting apparatus. The role played by minute quantities of impurities in controlling the properties of metals can then be determined. The foregoing discussion has revolved around a particular type of transistor action, namely the injection of charge carriers by a p-n type junction into a thin slice of semiconductor and their collection by another junction. It is also possible to get amplification by other means, as in the field-effect transistor, where a transverse electric field controls the flow of current. A number of such "unipolar" transistors were described by Shockley in 19525. This type of operation may have important advantages; in particular, high input impedance of the order of 10 megohms and the possibility of very high frequency response. Very similar in concept are the "analog" transistor and the spacistor. A field-effect transistor using an external "gate" is shown schematically in Fig. 3, while Fig. 4 shows a field-effect transistor using a p-n junction to produce a capacitor "gate" within the body of the semiconductor. Another significant step in high-power and high-frequency operation was the introduction of the p-n-i-p, or "intrinsic-barrier" transistor.6 This transistor is in essence a club sandwich, in which a layer of comparatively pure material is interposed between two of the layers of a conventional transistor. This layer permits closer control of the stream of charge carriers, isolates input and output areas and reduces the stored energy to make functioning at higher frequencies possible. The increased separation of input and output areas also permits operation at higher voltages than possible with earlier transistors. The intrinsic layer might be compared very roughly with the screen grid in a vacuum tube. Intrinsic barrier type transistors can provide uniform amplification over bands of hundreds of megacycles, and theoretically units can be made which will oscillate at 3,000 mc. They can also be designed to produce some 3 to 10 times more power than earlier junction transistors at high frequencies. 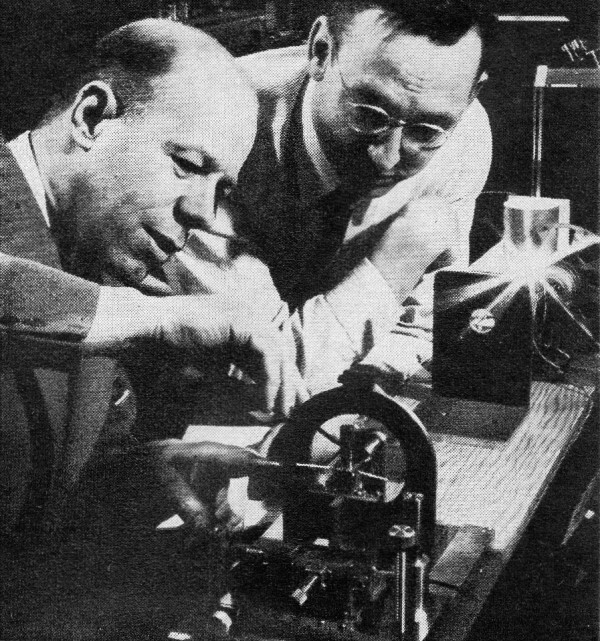 Testing the alignment of phototransistors used to "read" information stored by electronic computers, are Dr. J. N. Shive (left), who developed the phototransistor and Dr. R. M. Ryder, both of Bell telephone Laboratories. Fig. 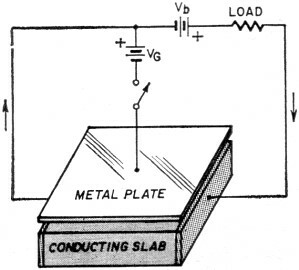 3 - Schematic representation of a field-effect transistor in a circuit designed to illustrate how current through the slab can be controlled by applying a voltage to the metal plate. Fig. 4 - A field-effect transistor using a p-n junction to produce a "capacitor" within the body of the semiconductor. 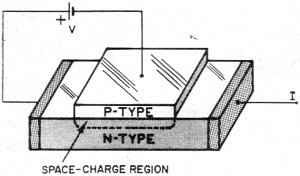 A voltage that is applied between the p- and n-type material causes a penetration of space charge, creating a region within the body of the n-type material that will not contribute to current flow through the semiconductor. The surface-barrier transistor7 represented another step toward high-frequency operation. In this unit, both sides of a thin wafer of germanium are electrolytically etched away until only an extremely thin layer remains. Electrodes are then deposited electrolytically. Because of the very thin base layer, high-frequency operation is possible. This transistor has since been further improved by incorporating a diffused base and by closely controlled alloying of the junctions. 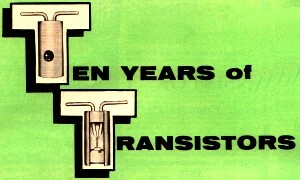 In 1954, Bell Laboratories announced a development which has proved to be a major breakthrough in transistor technology - the diffusion technique. Diffusion is a process by which minute amounts of impurities are introduced into a material in a controlled manner. As mentioned previously, one of the limitations in extending the operation of conventional junction transistors to ever higher and higher frequencies is the difficulty of reducing the thickness of the center layer of the transistor sandwich. By introducing impurities in a controlled manner by the diffusion process, this layer can be made as thin as 30/1,000,000 inch. The diffusion technique8,9 can be used for other semiconductor devices as well. Among these devices is the Bell solar battery.10 This battery consists of a thin wafer cut from a single crystal of n-type silicon into which a small amount of boron has been diffused to produce a thin layer of p-type silicon. When illuminated, this cell produces electricity. In direct sunlight, its conversion efficiency may run as high as 11 %. At present, it appears that the diffusion technique will achieve widespread recognition as a reliable, controllable process for making transistors and many other semiconductor devices. Enough information has been obtained on this process to make it adaptable to mass-production operations. Units have been fabricated which will oscillate and amplify at well over 1,000 mc, and the frequency barriers are continually being forced higher and higher. The "drift transistor" emphasizes another feature which has importance for high-frequency transistors.11 By control of the distribution of impurities in the thin central layer, one can obtain a "built-in" electrical field which speeds up the electron stream and thereby makes the transistor somewhat faster. Experimentally, the easiest way to achieve an appropriate structure is by diffusing the base as just mentioned above. Typically, the frequency response improves 10 or 100 times by making the base layer thinner while the built-in field gives a further improvement of the order of 1.5-4 times. Last year a new device was announced which combines high-frequency operation with high-power output to an extent not previously attained. This new transistor can provide an output of better than 5 watts at 10 mc, either as an oscillator or an amplifier. It has alpha-cutoff frequency of about 100 mc and has produced an output of better than 1 watt at this frequency. To achieve the combination of high power and high frequency required extensive research and the utilization of many different techniques. The unit employs the basic p-n-i-p type of construction and so takes advantage of the intrinsic-layer idea. Silicon is employed to permit operation at higher temperatures and thus allow greater heat dissipation. Diffusion techniques are used to form the emitter and collector regions. And the electrode areas themselves are kept as small as possible consistent with the desired power-handling capacity. Thus, by combining a number of techniques, both frequency and power barriers have been lifted. Electronic computing machines are one of the newest fields that transistors are expected to dominate because of their size, power, speed and reliability. Closely related is the field of automatic telephone switching, which now uses electromechanical switches such as relays but which is expected to go increasingly electronic in coming years. 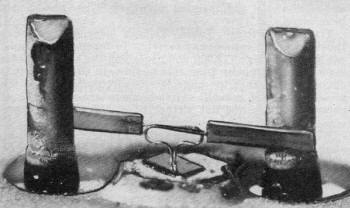 A prominent new device for use here is expected to be the p-n-p-n diode, a four-region transistor switch, invented by Shockley. As now realized in diffusion techniques in silicon, the device in the off condition has a resistance of 100 megohms. When switched on either by a pulse or by a high voltage, its on resistance is only about 2 ohms, with a less than 1-volt sustaining voltage. The device can be switched between these conditions at megacycle rates if necessary. A major problem in fabricating transistors, particularly those intended for high-frequency operation, is attaching leads to the semiconductor material. 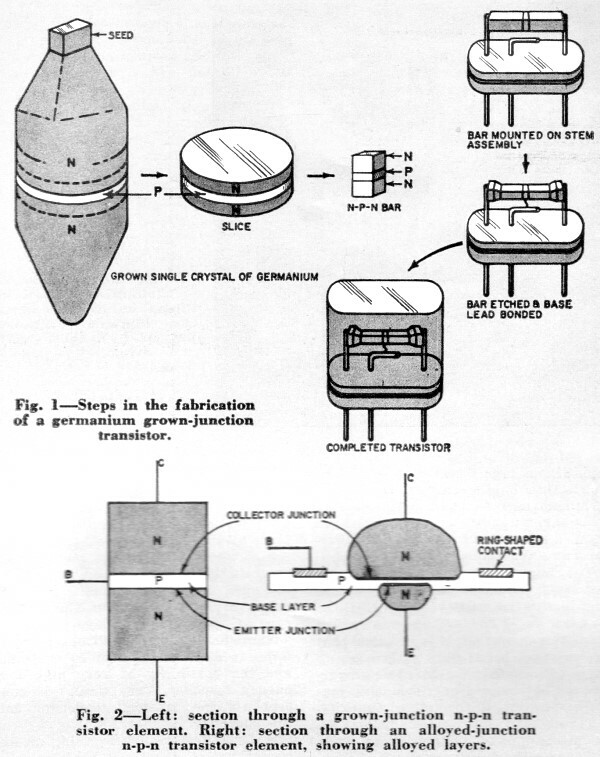 A significant advance in this field is the development of the thermocompression bonding technique at Bell Laboratories. 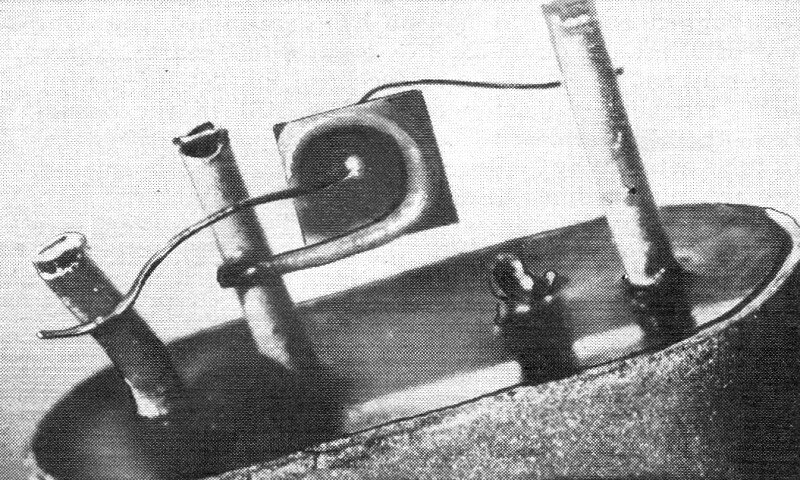 In this technique, the leads are attached by a combination of temperature, pressure and time. One method that works very satisfactorily in he laboratory is to force the lead against the semiconductor surface with a heated wedge-shaped tool. Neither the temperature nor the pressure is great enough to damage the semiconductor surface nor to introduce any impurities, and the time can be kept short enough to permit rapid assembly. Advantages of this method over soldering or welding are many. There is less danger of contamination; leads can be attached to very small areas - particularly useful in high-frequency transistors - and the bond between the lead and the semiconductor is stronger than the lead itself. Although today's practical transistors all use germanium or silicon, at least passing mention must be made of a new family of materials called intermetallic semiconductors. Silicon and germanium are in Group IV of the periodic chart; that is, they each contain four valence electrons in the outer ring. Compounds formed by taking elements from Group III (three valence electrons) and Group V (five valence electrons) will have an "average" of four valence electrons, and thus may exhibit characteristics similar to the materials now used. A great deal of exploratory work is being carried out in laboratories both in this country and abroad to determine the characteristics of these intermetallic compounds. Particularly active in his field is H. Welker, in Germany. Results have been very encouraging - it appears that these materials may be useful for producing more versatile transistors and other devices. In fact, intermetallic diodes are now on the market. Notable among the compounds under investigation are indium antimonide, gallium arsenide and indium phosphide. More complex compounds having an average of four valence electrons in the outer ring are also being investigated, and it is reasonable to expect that within a few years materials will be available which are superior in specific areas to either germanium or silicon. Important areas of exploration, at present, are in the areas of surface phenomena and external contamination. To produce reliable transistors having the desired characteristics without excessive rejects requires careful control of all the steps in the manufacturing process, with particular emphasis on avoiding contamination of any kind. Past efforts in this direction have paid off handsomely. Work is also under way to increase power and frequency capabilities of transistors to approach more closely the performance now available from electron tubes. An attempt has been made here to touch on the highlights of the last 10 years of transistor development. Many important contributions and contributors have of necessity been omitted for lack of space. It is important to emphasize that in this field, as well as any other scientific endeavor, notable advances are the result of the combined efforts of a number of scientists striving to unlock the secrets of nature. 1 W. Shockley, M. Sparks and G. K. Teal, "P-n Junction Transistors"; Physical Review, Vol. 83, pp. 151-62, July 1, 1951. 2 John S. Saby, "Fused Impurity P-n-p Junction Transistors"; Proceedings of the IRE, Vol. 40, P. 1358, November, 1952. 33 J. H. Shive, "The Phototransistor"; The Transistor: Selected Reference Material on Characteristics and Applications, Bell Telephone Laboratories, Inc., New York, 1951 (prepared for Western Electric Co.), p. 115. 4 R. L. Wallace, Jr., L. G. Schimpf and El Dickten, "A Junction Transistor Tetrode for High-Frequency Use"; Proceedings of the IRE, Vol. 40, p. 1395, November 1952. 5 W. Shockley, "A Unipolar 'Field-Effect' Transistor"; Proceedings of the IRE, Vol. 40, p. 1377, November, 1952. 6 J. M. Early, "P-n-i-p and N-p-i-n Junction Transistor Triodes" ; Bell System Technical Journal, Vol. 33, p. 517, May, 1954. 7 W. E. Bradley, et al, Proceedings of the IRE, December, 1953. 8 M. Tanenbaum, D. E. Thomas and C. A. Lee, "Diffused Emitters and Bases for Silicon and Germanium Transistors"; Bell System Technical Journal, January, 1956. 9 C. S. Fuller and J. A. Ditzenberger, "Diffusion of Donor and Acceptor Elements in Silicon"; Journal of Applied Physics, Vol. 27, May, 1956. 10 D. M. Chapin, C. S. Fuller and G. L. Pearson, "The Bell Solar Battery"; Bell Laboratories Record, July, 1955. 11 H. Kromer, "Theory of the Germanium Rectifier and the Transistor"; Zeitschrift Physik, Vol. 134, pp. 435-50, March 25, 1953. Robert M. Ryder was born March 8, 1915, in Yonkers, N. Y. He graduated from Yale in 1937, receiving a Bachelor of Science degree in physics. He obtained a PhD degree, also from Yale, in 1940. In July, 1940, he become a member of the technical staff of Bell Labs, working on microwave amplifier circuits. During World War II, he contributed to Bell Labs' research on the signal-to-noise performance of radars. In 1945, he joined the Electronic Development Department to work on microwave oscillators and amplifier tubes for radar and radio relay applications. He is currently a transistor development engineer, particularly interested in transistor development for high-frequency and other transmission applications. In 1957, Dr. Ryder received an award from the Institute of Radio Engineers "for contributions to the development of microwave tubes and applications of transistors." He is a member of the American Association for the Development of Science, Sigma Xi and the Yale Engineering Society.